When climate change comes for Boston, many expect it to come by sea, in the form of rising tides and massive storm surges that will sweep Logan Airport into the Atlantic. The city is already beginning to plan its defense, with proposals for “amphibious architecture,” levees, storm baffles, and pumping stations. But a new study out of Northeastern University suggests that for a dense coastal city like Boston, a more immediate vulnerability may lie in something we’re not even considering. It’s not rising seas that will get us first; it’s collapsing concrete. Untold tons of concrete make up the city’s buildings, bridges, roads, and parking garages. 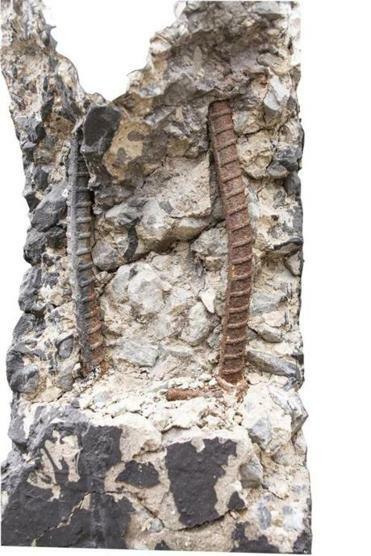 As solid as it looks, reinforced concrete is vulnerable to long-term corrosion and decay: Over the course of decades, elements from the environment slowly work their way through to corrode the metal rods inside. Two researchers, civil engineer Matthew Eckelman and graduate student Mithun Saha, realized that new projections of rising temperatures might have implications for the lifespan of Boston’s concrete buildings and set out to calculate just what exactly those were. Their findings, published in September in the journal Urban Climate, suggest that both this city and many others are likely to face huge repair bills long before anyone anticipated. “Starting in 2025 is when [we expect] to see the concrete cover on buildings start to fail, assuming they were built to code,” Eckelman says. With accelerated warming added to existing rates of decay, they predict that 60 percent of Boston’s concrete buildings will face structural deterioration by 2050. There’s no formal estimate for the scale of the cost, but a 2002 report from the Federal Highway Administration estimated that it takes $4 billion per year simply to maintain the country’s concrete bridges. That doesn’t include aging concrete buildings that will need to be repaired or torn down. Not everyone believes the effects will be so dramatic; Eckelman and Saha’s predictions are worst-case scenarios based on the most aggressive global warming projections, and they allow that the real result may be more modest. Other experts point out that such decay is only one factor among many that determine building lifespan, and suggest the problem can be solved with “fine-tuning” future building codes to take rising temperatures into account. But the Northeastern study, and the emerging knowledge about the lifespan of concrete, offers an unsettling look into the fragility of a material we’ve been leaning on, literally, for decades. Concrete was supposed to be one of the most solid materials we’ve engineered. What’s going on inside it suggests that for changes as sweeping as those the global climate is going through, there are enormous costs under the surface that we are only just beginning to grasp. In a sense, concrete is one of the most tested construction materials in human history. Ancient cultures in Mesopotamia, Egypt, and Assyria all had versions, and the Romans raised it to a high art. They combined lime, volcanic ash, and crushed pumice stones to build arches, aqueducts, roads, and bridges, some of which long outlived their empire. The nearly 2,000-year-old Roman Pantheon—a dome made of solid concrete—is still standing. In the modern era, concrete, usually made using a paste called Portland cement, was used in major public works like the Panama Canal and the Hoover Dam. Rebar construction was behind the big concrete building boom that took place after World War II. 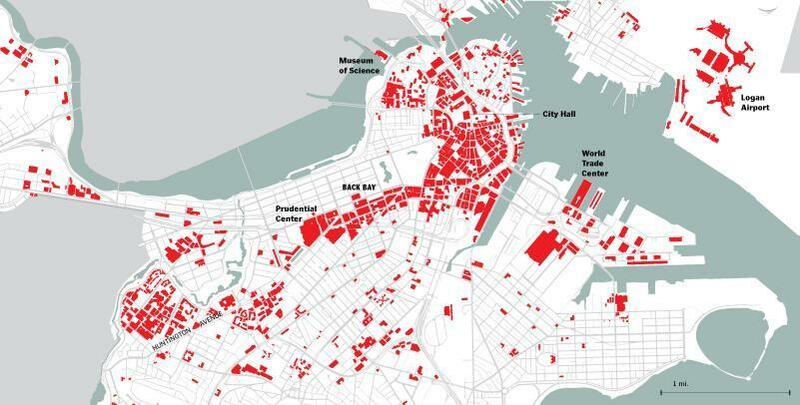 Of Boston’s 1,700 concrete buildings, Eckelman and Saha calculated that 57 percent were built in the 1960s. Notable buildings from the period include the John F. Kennedy Federal Building, City Hall, and Children’s Hospital. Even the Prudential Tower, which is mostly steel and glass on the outside, has a concrete foundation and concrete slabs on the roof. Eckelman and Saha’s study focuses on two processes that slowly eat away at concrete: carbonation, in which carbon dioxide diffuses into concrete, and chlorination, in which chloride ions, dissolved in water, are absorbed into concrete (especially a problem near the ocean, where chloride-rich salt spray coats buildings). Eventually the carbon dioxide or chlorides reach the rebar inside, causing it to corrode and expand. The process is largely invisible until a building’s façade cracks or chunks of concrete fall from a highway overpass. “It’s a very, very significant issue. Most garages built in the late 1960s, by the time they got into the late 1980s, they had major potholes,” Kelley says. “When Eisenhower built the interstate, we thought the bridges would last 75 years. We’re replacing those bridges now.” He cites the 2010 replacement of 14 overpass bridges on Interstate 93 north of Boston as just one example of the unexpected maintenance costs of concrete infrastructure. Environmental elements take time to work through concrete, and building codes take that into account—in the United States, the concrete covering of buildings has to be around an inch and a half thick, which is meant to ensure buildings last about 75 years. Eckelman and Saha realized that those building codes didn’t consider how the climate will change over the life of a building. They calculated that when you take global warming into account—both the temperature and the rising levels of carbon dioxide, which is part of the carbonation reaction—a concrete building built today in Boston will run into structural trouble within 50 to 60 years, as much as 25 years sooner than if temperatures remained steady. Even in the most extreme of the scenarios in their paper, Eckelman and Saha are not saying concrete is going to start raining down on pedestrians. The real impact will be financial—in the form of higher costs for new construction to avoid corrosion problems in the future, and potentially expensive repairs to buildings that exist now. Eckelman and Saha expect the first wave of advanced deterioration to begin around 2025. The risks are greatest for buildings built in the 1950s and 1960s—because they’re older and made from weaker concrete than we use today. As a map the researchers created shows, there are also greater threats downtown, where temperature increases are expected to be greatest. Their work adds to a growing concern among specialists that the problems with concrete so far haven’t been fully appreciated. “We have been saying this for a very long time,” says Nemkumar Banthia, an engineer at the University of British Columbia who has done similar work to Eckelman and Saha’s. “Our predictions for a number of cities around the world are fairly dire, and Boston is not as bad as some.” He says concrete buildings in London, Mumbai, Delhi, Vancouver, and Toronto face even greater risks. Others are less concerned. Mark Stewart, a civil engineer at the University of Newcastle who has modeled the impact of global warming on concrete buildings in Australia, anticipates most existing concrete buildings—which have a limited lifespan to begin with—will degrade for other reasons before global warming has a chance to take its toll. Kelley, meanwhile, says that places like Baltimore currently have “the climate you expect to happen [in Boston] over the next 75 years,” and notes that concrete buildings there aren’t in especially bad shape. The city of Boston is already thinking about how to ensure that buildings built today can withstand whatever the climate brings tomorrow. A year ago, the Boston Redevelopment Authority began requiring the developers of all major construction projects to detail how they’re preparing their buildings for warmer temperatures and rising sea levels. Brian Swett, chief of environment and energy for the city, says that if more studies validate Eckelman and Saha’s research, concrete could be the next concern added to the global warming builder’s checklist. Predicting the future of Boston’s concrete is complicated, given both the uncertainties inherent in climate change models and the fact that concrete hasn’t turned out to be quite as durable as anticipated. “We pretend we know what’s going on [with concrete], but we’re not designing durable structures as it is,” says Banthia. “If you then bring this issue of global climate change, this is a double whammy.” He adds that in Canada, the average lifespan of a building is down to 37 years. When it comes to new construction, Eckelman and Saha suggest increasing the thickness of the concrete cover applied to buildings by just 3 to 12 millimeters would be enough to offset enhanced carbonation and chlorination rates. That would increase building costs by 2 to 4 percent, they say. The American Concrete Institute, which produces guidelines that governments refer to when setting building codes, is currently reviewing standards for concrete thickness in light of global warming. Banthia, the chair of the committee, expects that within the next year it will recommend an increase. It’s also possible to spray reinforcing steel with a green epoxy, which creates a barrier between corrosive elements and the metal rebar (you can already see green-colored rebar at construction sites around Boston). Pockets of engineers are currently working on developing alternatives to steel entirely. Banthia’s research focuses on creating a form of polymer-based reinforcement; other possible replacements include aluminum bronze and carbon fiber, though all of these are more expensive than steel. Whether the next generation of concrete buildings lasts longer than the previous one, never mind the Pantheon, depends partly on technological progress, and partly on how much we decide we value creating lasting buildings. The use of concrete in midcentury icons like Boston City Hall was intended to evoke the monumentality of ancient survivors like the Pyramids and Roman arches, but has ended up creating a whole set of unintended maintenance problems.